Hello there, spooky bunnies! So okay, I know. It’s a *little* early to be so into the Halloween spirit, but I can’t seem to help it! Especially with so many cute cute goodies coming out! Collabor88 starts on Thursday [the 8th. It’s always the 8th!] 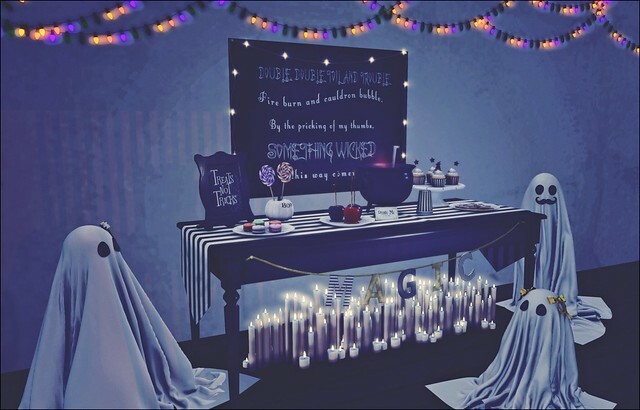 and What Next has this fabulous Witching Hour Treats table for it! I just love this! It’s a 10 piece set and as you can see, this table is decked OUT for you! Of course, you can rez it all out, OR you can use the pieces individually. The treats attach to your hand, and if you have the experiences turned on for your parcel, it’s automatic. But if you don’t, it’ll just ask if it can attach, same as usual. There’s a notecard that explains it all when you buy this, so read that if you want to know more about it. 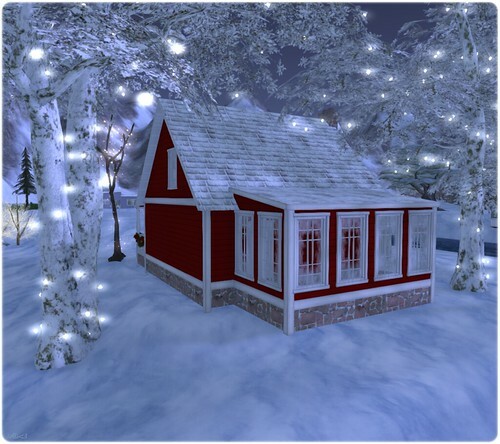 Have you ever noticed how when SL bloggers do home and garden posts, we decorate like we’re on Hoarders? 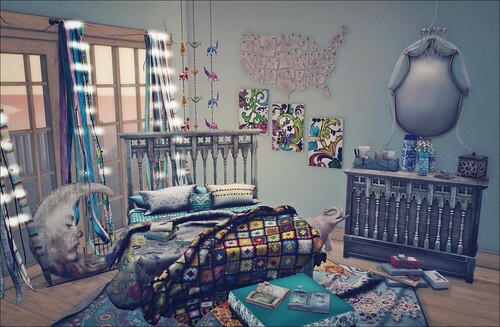 *laughs* Luckily, it’s a look that works and I had lots of fun decorating with a great bedroom set and some gacha items! I completely fell in love with the Delilah bedroom set from Cheeky Pea for Uber! The afghan on the bed reminds me of something my grandma would have made because she was all about crocheting granny squares. There is a version of the set that is done in more neutral colors, but I’m all about colorful things! If you haven’t been to The Arcade this month, and you like to decorate, you NEED to go. Seriously. This round is chock full of knick knacks and other items to decorate with! But Why Did She Ask? 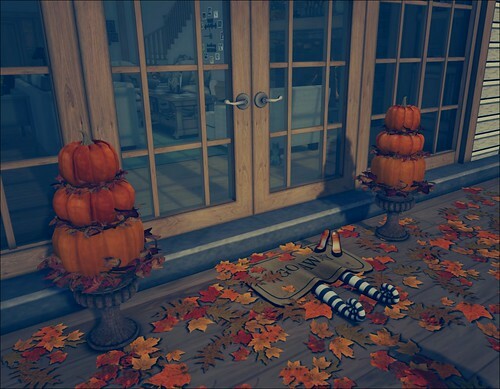 Happy Halloween, dear ones! So did you ever wonder while watching The Wizard Of Oz why Glinda asked Dorothy if she was a good witch or a bad witch like, a minute after saying only bad witches are ugly? Glinda, the queen of shade. If you haven’t done it yet, you need to get your Terror-iffic hunting on! It ends tonight! Tea.S is in the hunt and you can find the Wicked Mat! How cute, right?? 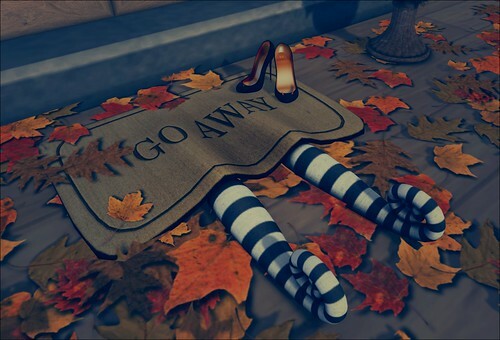 I chose the one that says “Go Away” but there is a “Welcome” one, too. Miseria is also in the Terror-iffic hunt and you can find the Demona stilettos. These are so cute! They have little horns on the tops and heel is like a devil’s tail! Remember that Terror-iffic is a pay hunt, so all the prizes are $5L each. But it is WELL worth it for what you get! Just get it done soon! By the way, if you’re in SL tonight and want to go trick or treating with your family [or just on your own because you like candy! 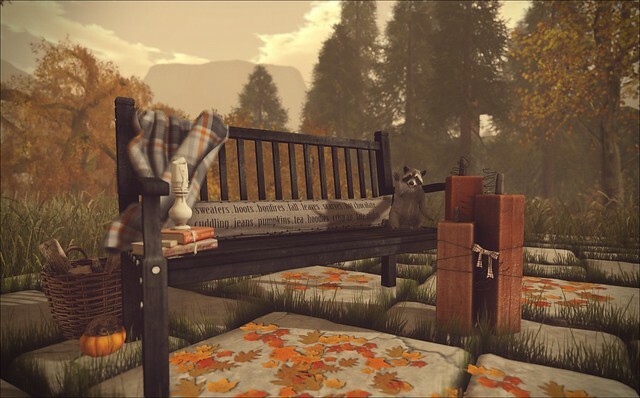 ], there is a grid-wide Trick or Treat event happening! Many families, including my own, have set candy out for you to take! Some places REALLY went all out with pumpkin patches and haunted houses and all kinds of stuff! Check it out if you’re interested! Be safe out there tonight, tricksters! The Home and Garden Expo is OPEN!! This is one of my favorite events of the year and I was thrilled to be invited back as a blogger for the third year in a row. The H&G Expo raises money for Relay For Life of Second Life, which donates money to the American Cancer Society. Funky Junk is part of the Expo this year and I’m loving the Small Garden Park! 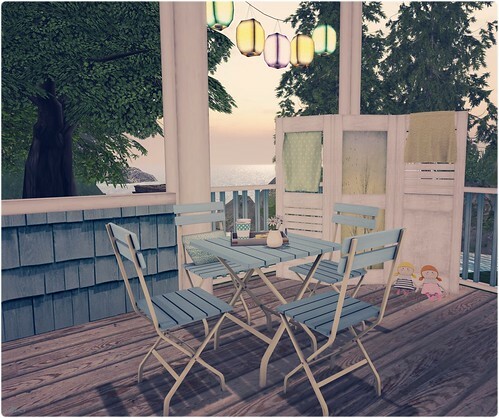 I’ll admit, I’m the worst at landscaping, so it’s awesome for me when people put together things that I can just throw out and it’s instapretty. There are four sections of this, 3 with trees and one with the little pond that has fish. [There is another version that does not have the pond.] I put this in the middle of a bunch of trees, but since it’s all contained in the brick walls, you can really put it anywhere you want. The Small Garden Park with the pond is 39 land impact [the one without the pond is 30] and currently available at the H&G Expo. The Home and Garden Expo runs until September 28th. The Home & Garden Expo is still going strong! You have a few days yet to head out there and see some of the fantastic work people have done and do some shopping for a good cause. Then when you’re finished shopping, head home, pour a glass of iced tea, and watch the sunset. Perfect day!